Beiges and Creams... and GIVEAWAY! 2. Like Megan E Sass Handknits on facebook. 3. 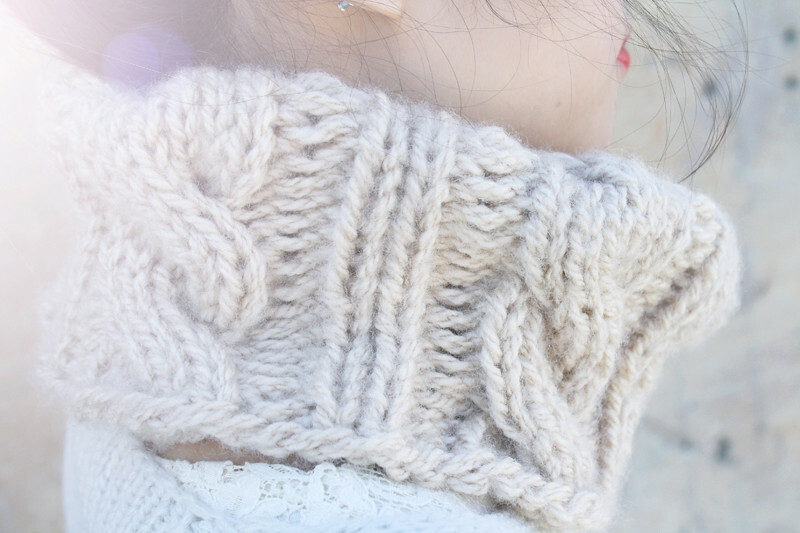 Comment this post with your email, along with how you would wear this cowl. Good luck! You have til 2/10 midnight PST to enter, winner will be chosen at random. PS. For a limited time only, Megan E Sass Handknits is also offering my readers 10% off! Use code "toshiko" to receive the discount at checkout. Knit top with leather sleeves from Zara. Lace dress with pleated ruffles hem from Hong Kong. Cable knit cowl in fisherman c/o Megan E Sass Handknits. 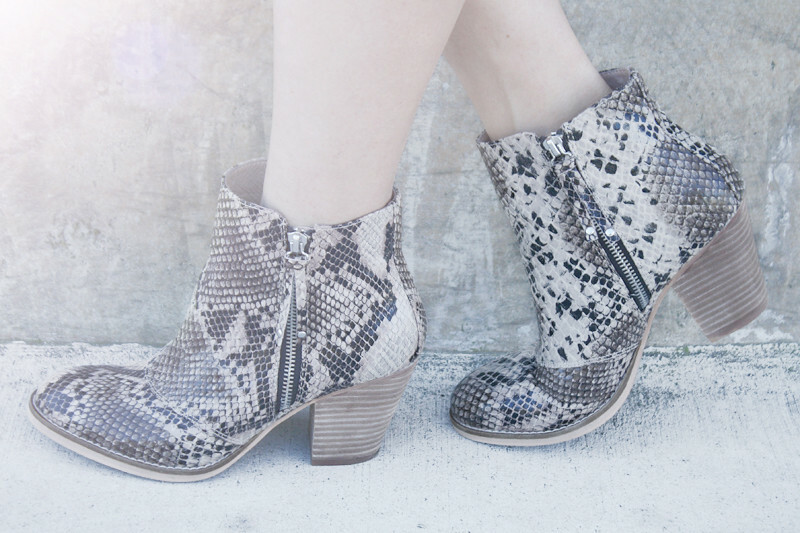 Snake print booties by Chelsea Crew from Bakers. i would wear it all the time couse i'm still catching colds and i'm literally sick of it, and this one looks really warm and it's sooo cute. I love the photos they make you look angelic. and... I'd wear the cowl with this grey swing coat I have with a big collar so I can keep my neck even warmer. Following your blog on bloglovin' and liked the fb page! I would wear the cowl with a navy top and a beige/tan skater skirt and tights since it's cold here! And a Navy coat over everything with the cowl peeking out. 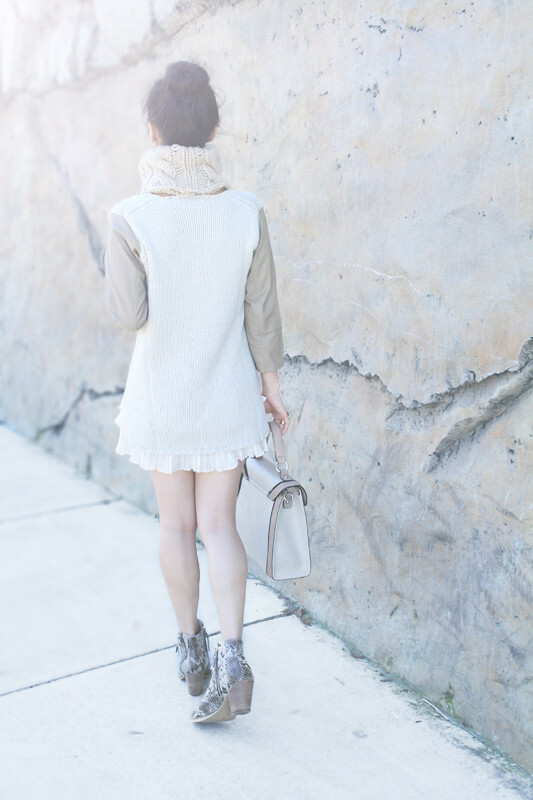 Following your blog on both GFC and bloglovin'! Liked her Facebook page, too! That cowl is just so adorable! I would probably wear it a simple shirt, cardigan, jeans and boots. I certainly would use it, it has been oh so very cold here lately. 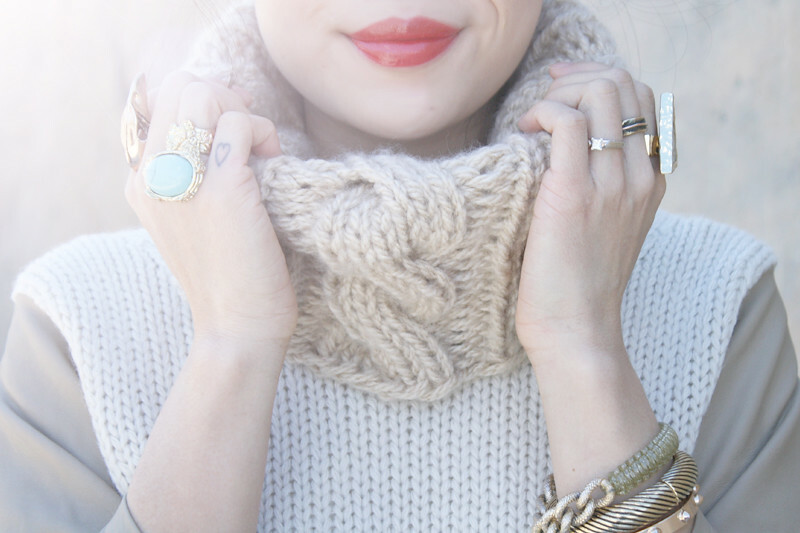 I love this knit cowl, it looks so sweet with your top knot bun! I'd probably pair this with a cardigan, tee and jeans. Not anything too fancy to take away from how awesome the cableknit is. And I love the "sky" color choice- I have a lot of grays, pinks and other neutrals in my wardrobe but I've been looking for the perfect touch of light blue! I would wear it on a chilly day with a plain sweater, knee high boots, high waist skirt, tights, and knee high socks. Such a lovely post..i like to Wear this with my Black coat! !